Welcome to our 19th season! This is Tri-state week, with a MA, RI, and NH ride. The weather is not looking great at this point for Monday, but it's still a few days away. I will send out GO / STOP status before 8:00 on Monday morning. It's been a great year for skiing, but the snow has put a crimp on our bicycling plans. We've never done a ride starting from Lexington before since it's outside our normal 1/2 hour drive from Groton "rule". The Minuteman Bikeway goes from the farms of Bedford to the urban environment of Cambridge but most importantly, it's plowed in the winter. The afternoon Beginner ride will head north on the Minuteman Bikeway to Bedford with a side trip to the Narrow Gauge Rail Trail. Sorry to bombard you with all these emails, but we all want a smooth, enjoyable season of bike rides. EVERYONE needs to sign a Waiver of Liability this season. You can find it here, or I will have copies with me. Please initial the yellow boxes and sign and date the bottom. It's gonna be a GREAT season, stay tuned for more information. Here is out latest "Frequently Asked Questions". There's even some bicycle buying advice! The Beginner Rides are mostly on road and on rail trails. Pretty much any bike will work, but you will be much happier with a quality lightweight bike. Most / all "department store" bikes are made in China from melted down tanks and are generally not very pleasant to ride. YES, YES, YES!!! I can't stress this enough! If I can't keep up, should I turn around and go back? No. Rides are designed to be comfortable for just about everyone. If however, you find the speed too demanding, we don't recommend giving up and turning back. We never leave anyone behind: we feel responsible for returning you safely to the starting point and will make an on-the-trail accommodations to assure this happens. If you insist on leaving the group, we will either detach someone to return with you, provide a map, or issue verbal instructions. Our first priority is your safety. Please review our Bicycling Safety Reminders below. It still doesn't look like biking weather (but the skiing has been EPIC!). 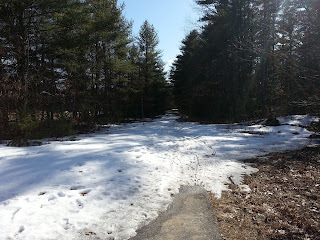 Anyhow, it seems very unlikely that the Nashua River Rail Trail will be clear of snow and ice for our opening day (April Fool's Day). Here is the current snow cover map, so our best bet is the Minuteman Bikeway which is plowed. The plan is to meet in Lexington Center, ride south for the morning Recreation Ride, have lunch in Lexington, and ride north for the afternoon Beginner Ride. The Wednesday (4/3/2013) Exploration Ride will meet in Woonsocket, RI and ride the beautiful Blackstone River Bikeway toward Providence. It's only finished to Central Falls (10.3 miles), so turn around point / lunch is TBD. The Friday (4/5/2013) Fitness Ride is TBD. Your first ride with us is FREE, so you don't need to sign up with one of the recreation departments (yet). We will ask you to sign our waiver though. To sign up, visit one of the following Recreation Department web sites.